This box uses a unique stereoscopic algorithm to increase apparent detail in video. HDMI vs. DisplayPort: Which display interface reigns supreme? To be candid, I went into my review of the DarbeeVision DVP-5000S video processor with a healthy dose of skepticism. TV manufacturers and content providers are adept at rendering video content as well their equipment allows, so what’s to improve? Apparently, more than I thought. Somewhat to my surprise, the DarbeeVision DVP-5000S increased detail and altered color for the better in many instances. It’s quite a good effect—in small doses, at least—especially with animation and games. Most of the in-house editorial debate was whether the effect—and the fact that it’s only effective with 1080p and lower-resolution video—fully justified its price tag. The DVP-5000S is a diminutive unit measuring about 2 inches wide by 4 inches long, by 0.5 inches thick. It sits in-line between the HDMI output from your video source and the HDMI input of your display. The processor is powered by a 5-volt/2000mA wall-wart power adapter. You can use the included remote control to switch DarbeeVision modes and to adjust how much of the effect is in play. 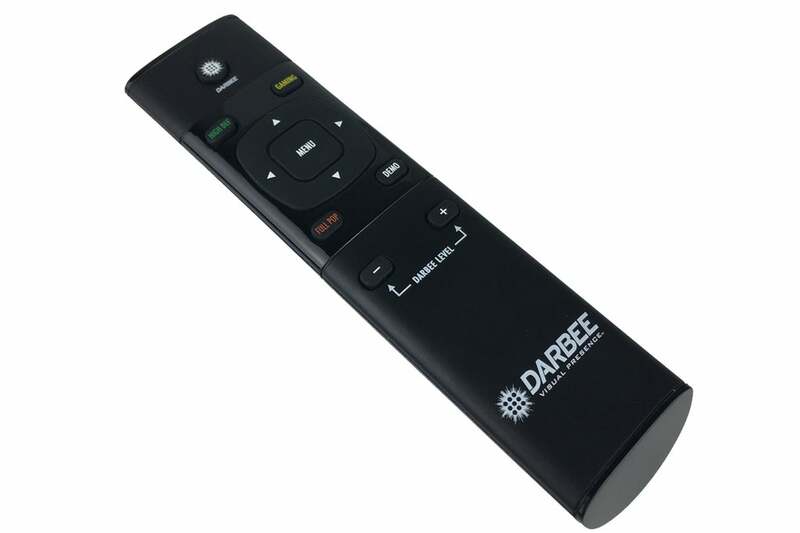 DarbeeVision also provides a small, simple remote control for navigating the DV-5000’s menus, which are superimposed over the picture shown on your display. The remote has one button for each of the three presets—gaming, movie, and computer—plus buttons to adjust the amount of DarbeeVision in play. A demo button shows you a split-screen view of what the material looks like with DarbeeVision engaged and bypassed. 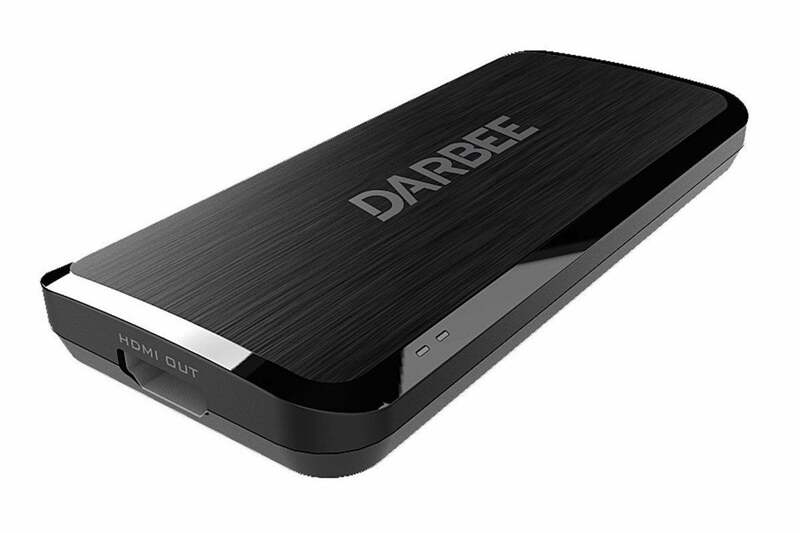 Oddly enough, not having read the docs thoroughly (deliberately so—it’s part of my ease-of-use evaluation), I first tried the Darbee with 2160p (4K Ultra HD) material, and it seemed to work just fine. This despite the fact that the DVP-5000s is intended for use only with 1080p video. It was only when we started getting weak signal complaints from the TVs and after a chat with DarbeeVision that I realized my error. So yes, the DVP-5000S is for 1080p material only. You’ll need to force your Ultra HD Blu-ray player’s output to that resolution and disable any upscaling to make sure you don’t get the same messages. The DVP-5000S comes with one HDMI cable, but you’ll need to provide the second. What looks good is many things to many people. There’s a science to eye fatigue and the like, but some people like a lot of color, others like more detail, and so on. It’s the latter crowd who will enjoy the DVP-5000S most, though the device can enhance color as well. 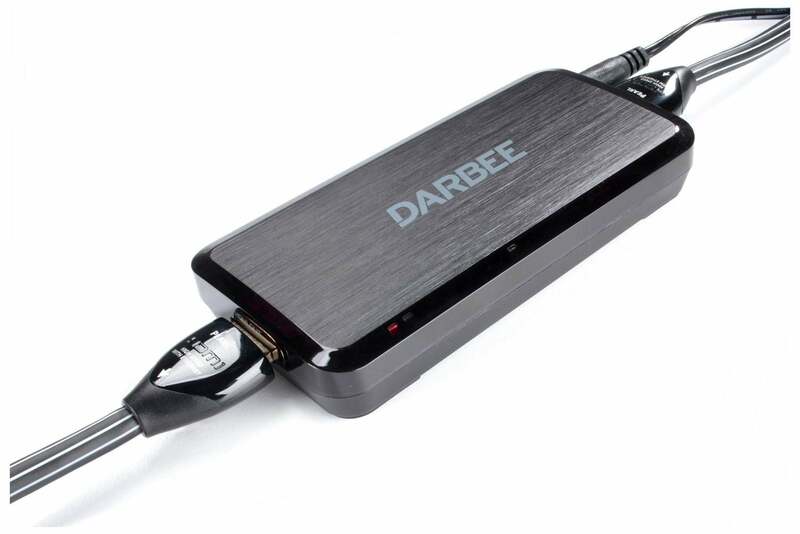 So what exactly is the Darbee effect? 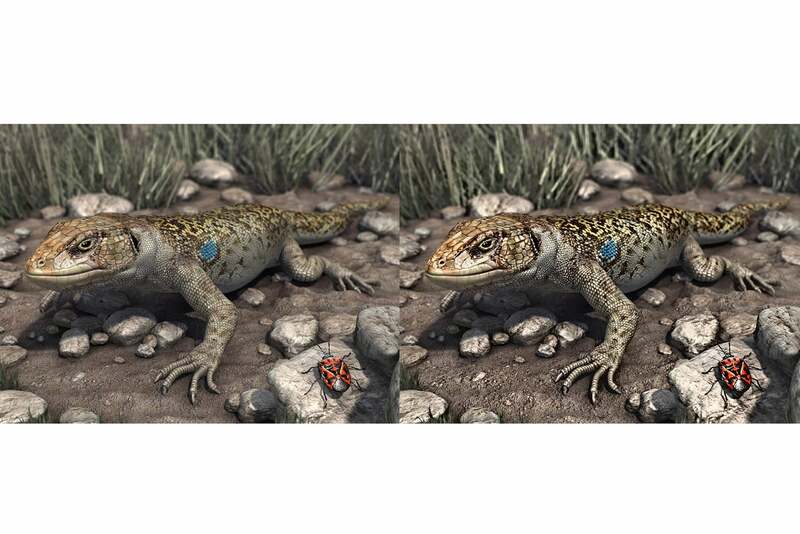 The DVP-5000S isn’t applying a simple sharpening filer (reduced anti-aliasing and color adjustment), it’s splitting the image into stereo components as you would with 3D. It then renders the difference in such a way that you see what appears to be more detail. It’s smart enough to leave large expanses of similar texture and color (sky, for instance) alone, and it tries to just apply the effect to the most detailed areas. Opinions of the effect varied in the lab. No one said they didn’t see a definite improvement in detail, but not everyone agreed that it was a desirable change. DarbeeVision recommends applying it at about 70 percent, but we wound up using about 50 percent with movies. The best results were with 1080p material played on 1080p displays.. 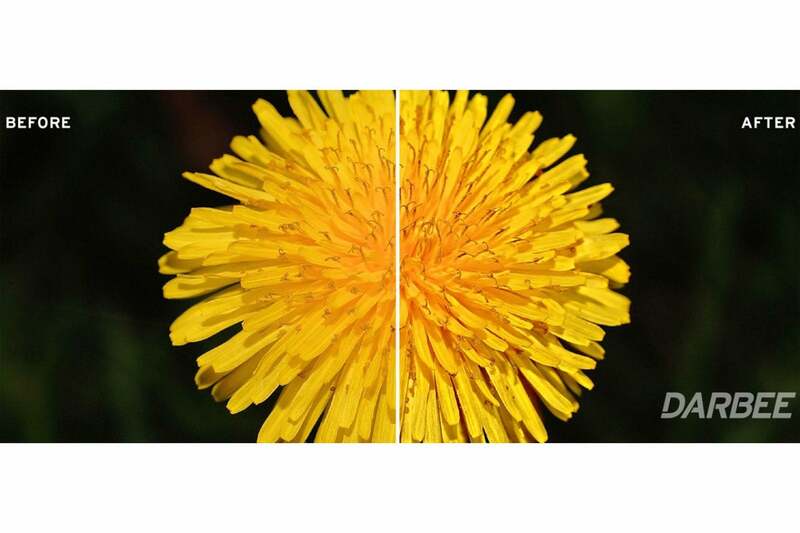 The two before-and-after images below were provided by DarbeeVision, but they are representative of the effect that we saw. The impact on objects in motion, on the other hand, was both good and bad. I’ll get to that in a moment. This image was provided by DarbeeVision, and according to our hands on—it’s accurate. What looks good static, however, doesn’t always look as impressive in motion. When perfectly still the DarbeeVision effect is very noticeable and desirable. With images in motion, it suffered some of the same motion artifacts you see when you simply over-sharpen any image your TV is displaying. Where the effect is not quite as nice is when things are in motion. Then you seem to wind up with some of the same moiré and “home video” type effects as you do when you over-sharpen an image using a TVs integrated adjustments. This, however, only applied to live content. Our resident console gamer found the DarbeeVision effect much to his liking. It’s also quite nice on any sort of animated material. Most of the viewers in the office preferred DarbeeVision when it was applied minimally, but it varied with the content. As I said, tastes vary. Ultimately, the biggest staff debate over the DVP-5000S wasn’t whether the effect was desirable, but how much we’d be willing to pay for it. You’ll find it selling on Amazon for around $120. That’s a little closer to what I and most of the IDG types who saw the unit in action might pay, rather than DarbeeVision’s $200 MSRP. But honestly, I’d be more comfortable in the $50 to $75 range. That said, the company is reportedly licensing the technology to TV manufacturers, and it says it has a working 4K model in the lab. So you might not need the box at all in the near future, it could become a standard tweak. But as I never tire of saying, one person’s moiré artifact is another person’s detail nirvana. Okay, I just made that up. It doesn’t make it any less true. This device will improve the perceived sharpness and palette of 1080p (or less) material sent over HDMI. We found it best with animated and gaming sources, but it does what it says it does with just about video up to that resolution.